On April 8, 2008, Sugar Hill Records released their fourth album with bluegrass stalwarts The Gibson Brothers. Iron & Diamonds showcases the brothers’ trademark harmonies as well as songwriting that is among the best in the genre. Interspersed with original songs like the title track- a snapshot of the miners’ baseball team in their upstate-NY home- are carefully chosen covers like Tom Petty’s “Cabin Down Below” and others. Iron & Diamonds boasts the brothers’ best vocal mix to date thanks to being able to record live on one mike, capturing the energy and closeness that concert audiences rave about. The band- Mike Barber on bass, Clayton Campbell on fiddle, and Rick Hayes on mandolin- is tighter than ever, complementing the brothers’ harmonies with adept instrumental performances. Leigh and Eric Gibson have been performing together since encouraged in their youth by a minister in the borderlands of upstate New York, where they still reside. 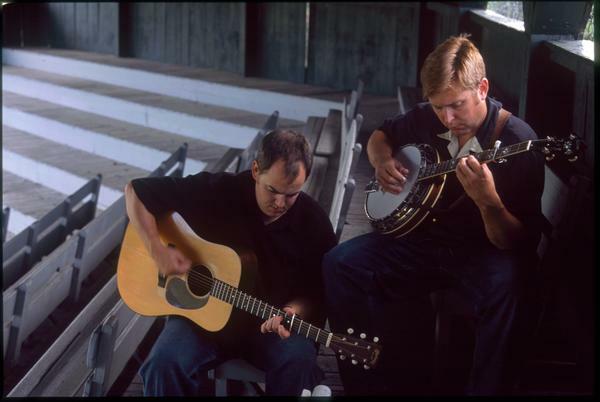 They received a Best Emerging Artist nod from the IBMA in 1998 and went on to record three albums for Sugar Hill Records- Bona Fide, Long Way Back Home, and Red Letter Day.